Moebius: Empire Rising is the second Kickstarter by a Sierra alumni that has successfully delivered a final product (the other is Al Lowe's Leisure Suit Larry: Reloaded). 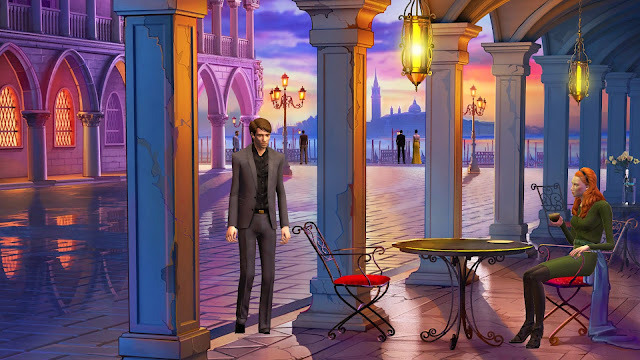 Jane Jensen, famous for being the writer of the Gabriel Knight series, has given us another mystery game for us to play with where you take on the role of an antiques dealer called Malachi Rector. Apparently, he's not just any antiques dealer as he's apparently got photographic memory, a keen eye for profiling and is a bit of a genius when it comes to history. In some ways, he reminds me a lot of Robert Downey Jr's interpretation of Sherlock Holmes. Gameplay: It's your typical point 'n' click adventure and seems to be made for PC - thankfully not a console or mobile port like so many games are nowadays. Music: Music is top notch just as it was in Gabriel Knight and Gray Matter, thanks to Jane Jensen's husband, Robert Holmes. The intro/credits theme is a true delight, sung by Jane and Robert's daughter, Raleigh Holmes. Graphics: The only thing really letting the game down at the moment are the graphics. Yes, I know that graphics don't maketh the game, but you usually have to at least have passable graphics in a point 'n' click adventure game. Malachi always seems hunched and has a really wonky walking animation while the clothing textures for all the characters are of a low quality. Also, while I don't mind the mix of 3D objects against painted backdrops occasionally they seem to forget adding high-resolution backgrounds as some are very pixellated. So far I'm enjoying the plot and if it continues on this course, the game's most important aspect will at least be safe. The graphics are really off-putting though and it's a shame that they didn't do a better job with it - even Gray Matter, which was released a few years ago has better walking animations and 3D models.